This article is about the preparation of food. For a general outline, see Outline of food preparation. For varied styles of international food, see cuisine. Cooking or cookery is the art, technology, science and craft of preparing food for consumption. Cooking techniques and ingredients vary widely across the world, from grilling food over an open fire to using electric stoves, to baking in various types of ovens, reflecting unique environmental, economic, and cultural traditions and trends. The ways or types of cooking also depend on the skill and type of training an individual cook has. Cooking is done both by people in their own dwellings and by professional cooks and chefs in restaurants and other food establishments. Cooking can also occur through chemical reactions without the presence of heat, such as in ceviche, a traditional South American dish where fish is cooked with the acids in lemon or lime juice. Preparing food with heat or fire is an activity unique to humans. It may have started around 2 million years ago, though archaeological evidence for it reaches no more than 1 million years ago. The expansion of agriculture, commerce, trade, and transportation between civilizations in different regions offered cooks many new ingredients. New inventions and technologies, such as the invention of pottery for holding and boiling water, expanded cooking techniques. Some modern cooks apply advanced scientific techniques to food preparation to further enhance the flavor of the dish served. Homo erectus may have begun cooking food as early as 500,000 years ago. Phylogenetic analysis suggests that human ancestors may have invented cooking as far back as 1.8 million to 2.3 million years ago. Re-analysis of burnt bone fragments and plant ashes from the Wonderwerk Cave, South Africa, has provided evidence supporting control of fire by early humans there by 1 million years ago. There is evidence that Homo erectus was cooking their food as early as 500,000 years ago. Evidence for the controlled use of fire by Homo erectus beginning some 400,000 years ago has wide scholarly support. Archaeological evidence from 300,000 years ago, in the form of ancient hearths, earth ovens, burnt animal bones, and flint, are found across Europe and the Middle East. Anthropologists think that widespread cooking fires began about 250,000 years ago, when hearths started appearing. Communication between the Old World and the New World in the Columbian Exchange influenced the history of cooking. The movement of foods across the Atlantic, from the New World, such as potatoes, tomatoes, maize, yams, beans, bell pepper, chili pepper, vanilla, pumpkin, cassava, avocado, peanut, pecan, cashew, pineapple, blueberry, sunflower, chocolate, gourds, and squash, had a profound effect on Old World cooking. The movement of foods across the Atlantic, from the Old World, such as cattle, sheep, pigs, wheat, oats, barley, rice, apples, pears, peas, chickpeas, green beans, mustard, and carrots, similarly changed New World cooking. In the seventeenth and eighteenth centuries, food was a classic marker of identity in Europe. In the nineteenth-century "Age of Nationalism" cuisine became a defining symbol of national identity. The Industrial Revolution brought mass-production, mass-marketing and standardization of food. Factories processed, preserved, canned, and packaged a wide variety of foods, and processed cereals quickly became a defining feature of the American breakfast. In the 1920s, freezing methods, cafeterias and fast food restaurants emerged. Along with changes in food, starting early in the 20th century, governments have issued nutrition guidelines, leading to the food pyramid (introduced in Sweden in 1974). The 1916 "Food For Young Children" became the first USDA guide to give specific dietary guidelines. Updated in the 1920s, these guides gave shopping suggestions for different-sized families along with a Depression Era revision which included four cost levels. In 1943, the USDA created the "Basic Seven" chart to make sure that people got the recommended nutrients. It included the first-ever Recommended Daily Allowances from the National Academy of Sciences. In 1956, the "Essentials of an Adequate Diet" brought recommendations which cut the number of groups that American school children would learn about down to four. In 1979, a guide called "Food" addressed the link between too much of certain foods and chronic diseases, but added "fats, oils, and sweets" to the four basic food groups. Carbohydrates include the common sugar, sucrose (table sugar), a disaccharide, and such simple sugars as glucose (made by enzymatic splitting of sucrose) and fructose (from fruit), and starches from sources such as cereal flour, rice, arrowroot and potato. The interaction of heat and carbohydrate is complex. Long-chain sugars such as starch tend to break down into simpler sugars when cooked, while simple sugars can form syrups. If sugars are heated so that all water of crystallisation is driven off, then caramelization starts, with the sugar undergoing thermal decomposition with the formation of carbon, and other breakdown products producing caramel. Similarly, the heating of sugars and proteins elicits the Maillard reaction, a basic flavor-enhancing technique. An emulsion of starch with fat or water can, when gently heated, provide thickening to the dish being cooked. In European cooking, a mixture of butter and flour called a roux is used to thicken liquids to make stews or sauces. In Asian cooking, a similar effect is obtained from a mixture of rice or corn starch and water. These techniques rely on the properties of starches to create simpler mucilaginous saccharides during cooking, which causes the familiar thickening of sauces. This thickening will break down, however, under additional heat. Types of fat include vegetable oils, animal products such as butter and lard, as well as fats from grains, including corn and flax oils. Fats are used in a number of ways in cooking and baking. To prepare stir fries, grilled cheese or pancakes, the pan or griddle is often coated with fat or oil. Fats are also used as an ingredient in baked goods such as cookies, cakes and pies. Fats can reach temperatures higher than the boiling point of water, and are often used to conduct high heat to other ingredients, such as in frying, deep frying or sautéing. Fats are used to add flavor to food (e.g., butter or bacon fat), prevent food from sticking to pans and create a desirable texture. Edible animal material, including muscle, offal, milk, eggs and egg whites, contains substantial amounts of protein. Almost all vegetable matter (in particular legumes and seeds) also includes proteins, although generally in smaller amounts. Mushrooms have high protein content. Any of these may be sources of essential amino acids. When proteins are heated they become denatured (unfolded) and change texture. In many cases, this causes the structure of the material to become softer or more friable – meat becomes cooked and is more friable and less flexible. In some cases, proteins can form more rigid structures, such as the coagulation of albumen in egg whites. The formation of a relatively rigid but flexible matrix from egg white provides an important component in baking cakes, and also underpins many desserts based on meringue. 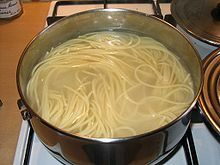 Water is often used to cook foods such as noodles. Cooking often involves water, frequently present in other liquids, which is both added in order to immerse the substances being cooked (typically water, stock or wine), and released from the foods themselves. A favorite method of adding flavor to dishes is to save the liquid for use in other recipes. Liquids are so important to cooking that the name of the cooking method used is often based on how the liquid is combined with the food, as in steaming, simmering, boiling, braising and blanching. Heating liquid in an open container results in rapidly increased evaporation, which concentrates the remaining flavor and ingredients – this is a critical component of both stewing and sauce making. Vitamins and minerals are required for normal metabolism but which the body cannot manufacture itself and which must therefore come from external sources. Vitamins come from several sources including fresh fruit and vegetables (Vitamin C), carrots, liver (Vitamin A), cereal bran, bread, liver (B vitamins), fish liver oil (Vitamin D) and fresh green vegetables (Vitamin K). Many minerals are also essential in small quantities including iron, calcium, magnesium, sodium chloride and sulfur; and in very small quantities copper, zinc and selenium. The micronutrients, minerals, and vitamins in fruit and vegetables may be destroyed or eluted by cooking. Vitamin C is especially prone to oxidation during cooking and may be completely destroyed by protracted cooking. [not in citation given] The bioavailability of some vitamins such as thiamin, vitamin B6, niacin, folate, and carotenoids are increased with cooking by being freed from the food microstructure. Blanching or steaming vegetables is a way of minimizing vitamin and mineral loss in cooking. A cook sautees onions and green peppers in a skillet. Steaming works by boiling water continuously, causing it to vaporise into steam; the steam then carries heat to the nearby food, thus cooking the food. By many it is considered a healthy form of cooking, holding nutrients within the vegetable or meat being cooked. En papillote – The food is put into a pouch and then baked, allowing its own moisture to steam the food. Smoking is the process of flavoring, cooking, or preserving food by exposing it to smoke from burning or smoldering material, most often wood. Cooking can prevent many foodborne illnesses that would otherwise occur if the food is eaten raw. When heat is used in the preparation of food, it can kill or inactivate harmful organisms, such as bacteria and viruses, as well as various parasites such as tapeworms and Toxoplasma gondii. Food poisoning and other illness from uncooked or poorly prepared food may be caused by bacteria such as pathogenic strains of Escherichia coli, Salmonella typhimurium and Campylobacter, viruses such as noroviruses, and protozoa such as Entamoeba histolytica. Bacteria, viruses and parasites may be introduced through salad, meat that is uncooked or done rare, and unboiled water. The sterilizing effect of cooking depends on temperature, cooking time, and technique used. Some food spoilage bacteria such as Clostridium botulinum or Bacillus cereus can form spores that survive boiling, which then germinate and regrow after the food has cooled. This makes it unsafe to reheat cooked food more than once. Cooking increases the digestibility of many foods which are inedible or poisonous when raw. For example, raw cereal grains are hard to digest, while kidney beans are toxic when raw or improperly cooked due to the presence of phytohaemagglutinin, which is inactivated by cooking for at least ten minutes at 100 °C (212 °F). Food safety depends on the safe preparation, handling, and storage of food. Food spoilage bacteria proliferate in the "Danger zone" temperature range from 40 to 140 °F (4 to 60 °C), food therefore should not be stored in this temperature range. Washing of hands and surfaces, especially when handling different meats, and keeping raw food separate from cooked food to avoid cross-contamination, are good practices in food preparation. Foods prepared on plastic cutting boards may be less likely to harbor bacteria than wooden ones. Washing and disinfecting cutting boards, especially after use with raw meat, poultry, or seafood, reduces the risk of contamination. A raw tomato sauce with olives, celery, spinach and walnuts on zucchini noodles. Proponents of raw foodism argue that cooking food increases the risk of some of the detrimental effects on food or health. They point out that during cooking of vegetables and fruit containing vitamin C, the vitamin elutes into the cooking water and becomes degraded through oxidation. Peeling vegetables can also substantially reduce the vitamin C content, especially in the case of potatoes where most vitamin C is in the skin. However, research has shown that in the specific case of carotenoids a greater proportion is absorbed from cooked vegetables than from raw vegetables. German research in 2003 showed significant benefits in reducing breast cancer risk when large amounts of raw vegetable matter are included in the diet. The authors attribute some of this effect to heat-labile phytonutrients. Sulforaphane, a glucosinolate breakdown product, which may be found in vegetables such as broccoli, has been shown to be protective against prostate cancer, however, much of it is destroyed when the vegetable is boiled. The USDA has studied retention data for 16 vitamins, 8 minerals, and alcohol for approximately 290 foods for various cooking methods. Chicken, pork and bacon-wrapped corn cooking in a barbecue smoker. Barbecuing and smoking generate carcinogens. In a human epidemiological analysis by Richard Doll and Richard Peto in 1981, diet was estimated to cause a large percentage of cancers. Studies suggest that around 32% of cancer deaths may be avoidable by changes to the diet. Some of these cancers may be caused by carcinogens in food generated during the cooking process, although it is often difficult to identify the specific components in diet that serve to increase cancer risk. Many foods, such as beef steak and broccoli, contain low concentrations of both carcinogens and anticarcinogens. Several studies published since 1990 indicate that cooking meat at high temperature creates heterocyclic amines (HCAs), which are thought to increase cancer risk in humans. Researchers at the National Cancer Institute found that human subjects who ate beef rare or medium-rare had less than one third the risk of stomach cancer than those who ate beef medium-well or well-done. While avoiding meat or eating meat raw may be the only ways to avoid HCAs in meat fully, the National Cancer Institute states that cooking meat below 212 °F (100 °C) creates "negligible amounts" of HCAs. Also, microwaving meat before cooking may reduce HCAs by 90% by reducing the time needed for the meat to be cooked at high heat. Nitrosamines are found in some food, and may be produced by some cooking processes from proteins or from nitrites used as food preservatives; cured meat such as bacon has been found to be carcinogenic, with links to colon cancer. Ascorbate, which is added to cured meat, however, reduces nitrosamine formation. Research has shown that grilling, barbecuing and smoking meat and fish increases levels of carcinogenic polycyclic aromatic hydrocarbons (PAH). In Europe, grilled meat and smoked fish generally only contribute a small proportion of dietary PAH intake since they are a minor component of diet – most intake comes from cereals, oils and fats. However, in the US, grilled/barbecued meat is the second highest contributor of the mean daily intake of a known PAH carcinogen benzo[a]pyrene at 21% after ‘bread, cereal and grain’ at 29%. Baking, grilling or broiling food, especially starchy foods, until a toasted crust is formed generates significant concentrations of acrylamide, a known carcinogen from animal studies; its potential to cause cancer in humans at normal exposures is uncertain. Public health authorities recommend reducing the risk by avoiding overly browning starchy foods or meats when frying, baking, toasting or roasting them. Cooking dairy products may reduce a protective effect against colon cancer. Researchers at the University of Toronto suggest that ingesting uncooked or unpasteurized dairy products (see also Raw milk) may reduce the risk of colorectal cancer. Mice and rats fed uncooked sucrose, casein, and beef tallow had one-third to one-fifth the incidence of microadenomas as the mice and rats fed the same ingredients cooked. This claim, however, is contentious. According to the Food and Drug Administration of the United States, health benefits claimed by raw milk advocates do not exist. "The small quantities of antibodies in milk are not absorbed in the human intestinal tract," says Barbara Ingham, PhD, associate professor and extension food scientist at the University of Wisconsin-Madison. "There is no scientific evidence that raw milk contains an anti-arthritis factor or that it enhances resistance to other diseases." Heating sugars with proteins or fats can produce advanced glycation end products ("glycotoxins"). Deep fried food in restaurants may contain high level of trans fat, which is known to increase levels of low-density lipoprotein that in turn may increase risk of heart diseases and other conditions. However, many fast food chains have now switched to trans-fat-free alternatives for deep-frying. The application of scientific knowledge to cooking and gastronomy has become known as molecular gastronomy. This is a subdiscipline of food science. Important contributions have been made by scientists, chefs and authors such as Herve This (chemist), Nicholas Kurti (physicist), Peter Barham (physicist), Harold McGee (author), Shirley Corriher (biochemist, author), Heston Blumenthal (chef), Ferran Adria (chef), Robert Wolke (chemist, author) and Pierre Gagnaire (chef). Chemical processes central to cooking include the Maillard reaction – a form of non-enzymatic browning involving an amino acid, a reducing sugar and heat. Home cooking has traditionally been a process carried out informally in a home or around a communal fire, and can be enjoyed by all members of the family, although in many cultures women bear primary responsibility. 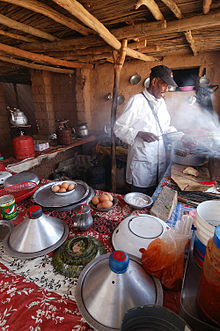 Cooking is also often carried out outside of personal quarters, for example at restaurants, or schools. 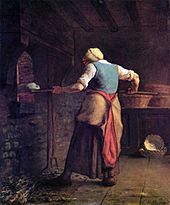 Bakeries were one of the earliest forms of cooking outside the home, and bakeries in the past often offered the cooking of pots of food provided by their customers as an additional service. In the present day, factory food preparation has become common, with many "ready-to-eat" foods being prepared and cooked in factories and home cooks using a mixture of scratch made, and factory made foods together to make a meal. The nutritional value of including more commercially prepared foods has been found to be inferior to home-made foods. Home-cooked meals tend to be healthier with fewer calories, and less saturated fat, cholesterol and sodium on a per calorie basis while providing more fiber, calcium, and iron. The ingredients are also directly sourced, so there is control over authenticity, taste, and nutritional value. The superior nutritional quality of home-cooking could therefore play a role in preventing chronic disease. Cohort studies following the elderly over 10 years show that adults who cook their own meals have significantly lower mortality, even when controlling for confounding variables. "Home-cooking" may be associated with comfort food, and some commercially produced foods are presented through advertising or packaging as having been "home-cooked", regardless of their actual origin. ^ W. Wayt Gibbs; Nathan Myhrvold (2011). "A New Spin on Cooking". Scientific American. 304 (3): 23. Bibcode:2011SciAm.304c..23G. doi:10.1038/scientificamerican0311-23a. PMID 21438483. ^ Organ, Chris (22 August 2011). "Phylogenetic rate shifts in feeding time during the evolution of Homo". PNAS. 108 (35): 14555–14559. Bibcode:2011PNAS..10814555O. doi:10.1073/pnas.1107806108. PMC 3167533. PMID 21873223. ^ Pollard, Elizabeth (2015). Worlds Together, Worlds Apart. New York: Norton. p. 13. ISBN 978-0-393-92207-3. ^ "Archaeologists Find Earliest Evidence of Humans Cooking With Fire - DiscoverMagazine.com". ^ Smith, Roff (29 January 2014). "Oldest Known Hearth Found in Israel Cave". National Geographic. Retrieved 17 March 2014. ^ "Pennisi: Did Cooked Tubers Spur the Evolution of Big Brains?". Cogweb.ucla.edu. Retrieved 7 November 2013. ^ Staff (12 August 2016). "What Does It Mean To Be Human? - Hearths & Shelters". Smithsonian Institution. Retrieved 12 August 2016. ^ Nunn, Nathan; Qian, Nancy (2010). "The Columbian Exchange: A History of Disease, Food, and Ideas". Journal of Economic Perspectives. 24 (2): 163–188. CiteSeerX 10.1.1.232.9242. doi:10.1257/jep.24.2.163. JSTOR 25703506. ^ "The history of the food pyramid". Washington Post. 31 January 2011. Retrieved 18 April 2013. ^ "Carbohydrates: MedlinePlus Medical Encyclopedia". medlineplus.gov. Retrieved 4 February 2019. ^ "What is...roux?". MICHELIN Guide. Retrieved 4 February 2019. ^ a b "Cooking vegetables 'improves benefits'". BBC News. 2 June 1999. Retrieved 30 April 2010. ^ Hotz, Christine; Gibson, Rosalind S. (2007). "Traditional food-processing and preparation practices to enhance the bioavailability of micronutrients in plant-based diets". The Journal of Nutrition. 137 (4): 1097–1100. doi:10.1093/jn/137.4.1097. PMID 17374686. ^ "Foodborne Illnesses". National Institute of Diabetes and Digestive and Kidney Diseases. ^ Noah ND, Bender AE, Reaidi GB, Gilbert RJ (July 1980). "News, Notes, And Epidemiology". Br Med J. 281 (6234): 236–237. doi:10.1136/bmj.281.6234.235. PMC 1713670. PMID 7407532. ^ "Grilling and Food Safety" (PDF). USDA. June 2017. Retrieved 30 January 2019. ^ "Basics for Handling Food Safely". United States Department of Agriculture. Archived from the original on 28 September 2004. Retrieved 1 April 2012. ^ "Cutting Boards (Plastic Versus Wood)". Food Safety, Preparation and Storage Tips. Cooperative Extension, College of Agriculture & Life Sciences, the University of Arizona. 1998. Archived from the original on 13 June 2006. Retrieved 21 June 2006. ^ a b "Cutting Boards – wood or plastic?". ReluctantGourmet.com. Archived from the original on 2 July 2006. Retrieved 21 June 2006. ^ "Potato, nutrition and diet - International Year of the Potato 2008". ^ Jin, Y.; Wang, M.; Rosen, R. T.; Ho, C. T. (1999). "Thermal Degradation of Sulforaphane in Aqueous Solution". Journal of Agricultural and Food Chemistry. 47 (8): 3121–3123. doi:10.1021/jf990082e. PMID 10552618. ^ Bongoni, R; Verkerk, R; Steenbekkers, B; Dekker, M; Stieger (2014). "Evaluation of Different Cooking Conditions on Broccoli (Brassica oleracea var. italica) to Improve the Nutritional Value and Consumer Acceptance". Plant Foods for Human Nutrition. 69 (3): 228–234. doi:10.1007/s11130-014-0420-2. PMID 24853375. ^ "USDA Table of Nutrient Retention Factors, Release 6" (PDF). USDA. USDA. December 2007. ^ Doll, R.; Peto, R. (1981). "The causes of cancer: Quantitative estimates of avoidable risks of cancer in the United States today". Journal of the National Cancer Institute. 66 (6): 1191–1308. doi:10.1093/jnci/66.6.1192. PMID 7017215. ^ Willett WC (1995). "Diet, nutrition, and avoidable cancer". Environ Health Perspect. 103 (Suppl 8): 165–70. doi:10.1289/ehp.95103s8165. PMC 1518978. PMID 8741778. ^ a b Carcinogens and Anticarcinogens in the Human Diet. National Academy Press. 1996. ISBN 978-0-309-05391-4. ^ a b "Heterocyclic Amines in Cooked Meats". National Cancer Institute. 2018. ^ Scanlan RA. (1983). "Formation and occurrence of nitrosamines in food". Cancer Res. 43 (5 Suppl): 2435s–2440s. PMID 6831466. ^ a b Scientific Committee on Food (4 December 2002). "Polycyclic Aromatic Hydrocarbons – Occurrence in foods, dietary exposure and health effects" (PDF). European Commission. Archived from the original (PDF) on 19 May 2011. Retrieved 21 August 2010. ^ a b "Food Controversies—Acrylamide". Cancer Research UK. 2016. Retrieved 23 January 2017. ^ Corpet DE, Yin Y, Zhang XM, et al. (1995). "Colonic protein fermentation and promotion of colon carcinogenesis by thermolyzed casein". Nutr Cancer. 23 (3): 271–81. doi:10.1080/01635589509514381. PMC 2518970. PMID 7603887. ^ Corpet DE, Stamp D, Medline A, Minkin S, Archer MC, Bruce WR (November 1990). "Promotion of colonic microadenoma growth in mice and rats fed cooked sugar or cooked casein and fat". Cancer Res. 50 (21): 6955–8. PMID 2208161. ^ Zhang XM, Stamp D, Minkin S, et al. (July 1992). "Promotion of aberrant crypt foci and cancer in rat colon by thermolyzed protein". J. Natl. Cancer Inst. 84 (13): 1026–30. doi:10.1093/jnci/84.13.1026. PMID 1608054. ^ "Got Milk?" by Linda Bren. FDA Consumer. Sept–Oct 2004. ^ Koschinsky T, He CJ, Mitsuhashi T, Bucala R, Liu C, Buenting C, Heitmann K, Vlassara H (1997). "Orally absorbed reactive glycation products (glycotoxins): An environmental risk factor in diabetic nephropathy". Proc. Natl. Acad. Sci. U.S.A. 94 (12): 6474–9. Bibcode:1997PNAS...94.6474K. doi:10.1073/pnas.94.12.6474. PMC 21074. PMID 9177242. ^ "McDonald's finally picks trans-fat-free oil". MSNBC. 30 January 2007. Retrieved 13 September 2007. ^ Forever, Cooking. "The People of Food Science: Who Are They?". 5amily. Retrieved 20 October 2018. ^ "Food-Info.net : Maillard reactions". www.food-info.net. Retrieved 29 March 2017. ^ Jackson, Cecile (2013). Men at Work: Labour, Maculinities, Development. New York: Routledge. p. 225. ^ Lin, Biing-Hwan; Guthrie, Joanne. "Nutritional Quality of Food Prepared at Home and Away From Home, 1977-2008". www.ers.usda.gov. U.S. Department of Agriculture. Archived from the original on 22 November 2015. Retrieved 21 November 2015. ^ Reicks, Marla; Trofholz, Amanda C.; Stang, Jamie S.; Laska, Melissa N. (1 August 2014). "Impact of cooking and home food preparation interventions among adults: outcomes and implications for future programs". Journal of Nutrition Education and Behavior. 46 (4): 259–276. doi:10.1016/j.jneb.2014.02.001. ISSN 1878-2620. PMC 4063875. PMID 24703245. ^ Soliah, Lu Ann Laurice; Walter, Janelle Marshall; Jones, Sheila Ann (1 March 2012). "Benefits and Barriers to Healthful Eating What Are the Consequences of Decreased Food Preparation Ability?". American Journal of Lifestyle Medicine. 6 (2): 152–158. CiteSeerX 10.1.1.1026.8612. doi:10.1177/1559827611426394. ISSN 1559-8276. ^ Chen, Rosalind Chia-Yu; Lee, Meei-Shyuan; Chang, Yu-Hung; Wahlqvist, Mark L. (1 July 2012). "Cooking frequency may enhance survival in Taiwanese elderly" (PDF). Public Health Nutrition. 15 (7): 1142–1149. doi:10.1017/S136898001200136X. ISSN 1475-2727. PMID 22578892. ^ Jones, Michael Owen; Long, Lucy M. (14 April 2017). Comfort Food: Meaning and Memories. Univ. Press of Mississippi. ISBN 978-1-4968-1086-1. Chisholm, Hugh, ed. (1911). "Cookery" . Encyclopædia Britannica. 7 (11th ed.). Cambridge University Press. pp. 74–76.